The Daihatsu Midget is a single-seat mini-truck made bi Japanese automaker Daihatsu. Several distinct vehicles haes borne the Midget name ower the years, but aw hae haed in common a single-seat utilitarian design, wi an enclosed or semi-enclosed cab. A Daihatsu Midget MP4 model. The oreeginal Midget featurt a single seat, a doorless cab, an handlebar steering. In 1957 the DK Midget wis introduced. The ingine wis an air-cooled 2-stroke design o 250 cc whilk produced 10 hp. In 1959 the MP Midget wis introduced - updatit wi siclike features as a steering wheel, doors, an seatin for twa. The ingine wis an air-cooled 2-stroke design o 305 cc which produced 12 hp. Subsequent revisions tae the MP design wis made, resultin in the model MP4 (whilk featurt a lairger cargo bed than the oreeginal model) an hinderly the MP5 (which introduced automatic ile mixin for the 2 stroke ingine) whilk remained in production til 1972. Bi 1972, 336,534 units haed been produced, an production wis terminated acause o the faw in popularity o three wheeled models tae mair modren fower wheel models. The Midget I haes forby been selt ootwi Japan as the "Bajaj", "Tri-Mobile", or "Bemo". 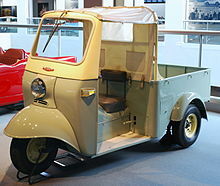 It is ane o the first caurs manufactured bi the Japanese automaker Daihatsu, kent for its laich-cost, practical vehicles. Awmaist exclusively uised as an autorickshaw (or 'tuk-tuk'), the Midget wis a weel-kent icon o public transportation in Sooth Asie. Nae meant for performance, this obscure vehicle daes weave throu lairger traffeck weel, in maugre o the fact that it anerlie haes three wheels. Thir oreeginal tuk-tuks ar a bit harder tae fin in modren times. In Thailand, the Midget MP4 is still in production as an Chinnaraje Midget in Chiang Mai an as an TukTuk Midget MP4 in Bangkok. The facelifted version, kent as MP5 is an aa still manufactured bi the TukTuk (Thailand) Co., Ltd. in Bangkok. Frae 1996 tae 2001, Daihatsu manufactured a fower wheel kei Midget wi fower-wheel drive or air conditionin as options. As Kei caurs, thay wur plenisht wi 660 cc engines. The Midget II (Japanese: Daihatsu Midget) wis introduced as a concept at the 1993 Tokyo Motor Show. Thare 2 teep o engines available, differentiate bi the injection type, ane bein electronic. Baith ar identical in width an height, but the EFI (Electronic Fuel Injection) version is shorter bi 75mm. Thay ar available in ane-seater or 2-seater, wi automatic an manual transmissions available. Wikimedia Commons haes media relatit tae Category:Daihatsu Midget.